As part of my graduate studies, I was tasked to create a reminder application for a fictitious company named Reminder X. There were two "clients" for this project, Vera and Jorge. 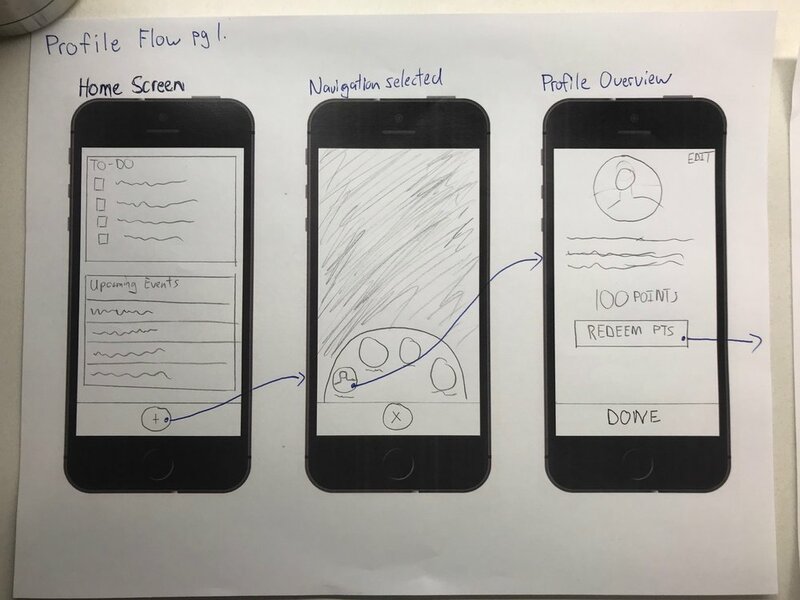 This page outlines the design process in detail from research, all the way to UI design. The Co-founder of ReminderX, Vera, has asked Jesse to supply design direction. She would like to know what user groups to focus on, what problems need to be solved, and how to solve those problems. Vera is aware that there are similar apps on the market but would like the ReminderX app to be more engaging than just generic reminder app. Vera has realized that she needs some direction on how to best serve their users. Through extensive user research Jesse will provide a insight on what users want, and how ReminderX can meet those needs with the ReminderX app. Jesse will help ReminderX design an app that is easy to use and limits the possibility of costly re-work later in the product development life cycle. 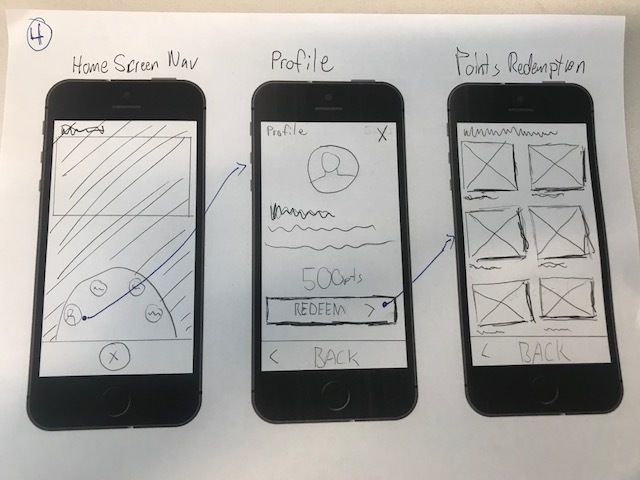 Jesse will conduct user research to discover the target users, creating low-fidelity sketched workflows and wireframes, and create an annotated interactive digital prototype. Jesse will deliver one design that will be the bases of design for both apple and android device applications. He will not provide separate designs for each platform. ReminderX is giving complete creative freedom to Jesse for the purposes of discovering the target users wants and needs. ReminderX has not provided any pre-conditions or restrictions on the design work. These deliverables along with stakeholder feedback will inform the creation of the ReminderX app. Jesse has conducted user research for ReminderX in order to aid in the creation of the ReminderX app. He has completed multiple interviews with potential users in order to gain insight on their wants and needs for a reminder application. The findings and recommendations are outlined in this document. As outlined in the Research Protocol document, Jesse conducted 4 formal user interviews with research participants. These interviews followed a pre-written script with some improvised follow-up questions. In addition to these 4 formal interviews, Jesse conducted a competitor analysis in which he analyzed similar reminder applications on the market today. Most research participants were adequately satisfied, but not delighted with the native reminder application on their mobile devices. ReminderX would need to provide compelling reasons for users to switch to ReminderX from what they are already using for reminders. 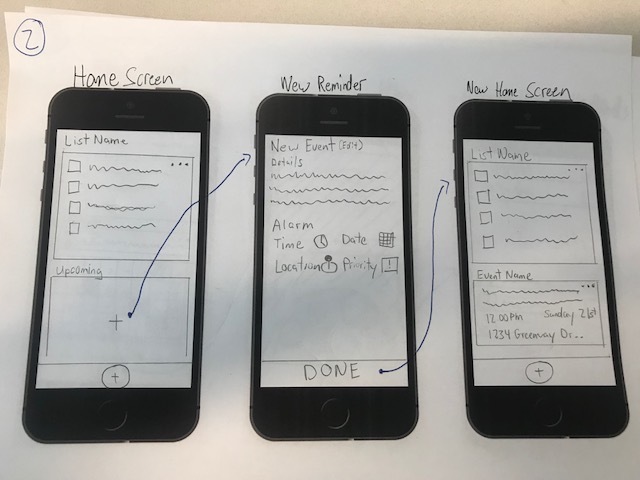 The biggest digital competitor is the native iOS reminder application and the most basic competitor is a pen and paper. Many of the research participants admitted to simply using sticky notes and placing them on their desk or monitor as a reminder. When someone “completes” a task, send push notifications to all devices that are “synced” with the reminder list. Consider voice dictation integrated into the app. Shared lists of items aka set a to-do for other people and add a reminder. Incentivizing users to complete tasks on their to-do list with points, badges, etc. Based upon my research, most interviewees were satisfied, but not delighted, by their reminder application tool of choice. Most admitted that there was room for improvement. The recommended features, if implemented correctly, would allow ReminderX to entice users to switch from their current method of reminders to ReminderX. Tom is a project manager at a fortune 500 company located in Chicago Illinois. He is married to his wife, Jane, and has a 4-year-old daughter named Jessica. He lives in a single bedroom condo in downtown Chicago that he is trying to sell in order to move to the suburbs. During the week Tom drops off his daughter on Mondays and Thursdays while Jane works her part-time job. On Mondays and Thursday Tom has to take Jessica to swim lessons by 5:45 or else he gets a cancelation fee. He also has a lot of work to do to get his condo ready to be sold. Occasionally at work he loses track of action items from one of his meetings and has schedule a follow up meeting. Communication with his wife about childcare, grocery lists etc. ReminderX will allow users to create to-do lists and reminders for themselves and for their friends and family. The app will alert users when a shared to-do item has been completed by another user and will allow users to send reminders to other users via a shared calendar. What: Aid in the creation of reminders and to-do lists. When: Whenever something pops into the users head they should be able to quickly open the ReminderX app and create a list item for it. Make adding to-dos and reminders as easy and as fast as possible. 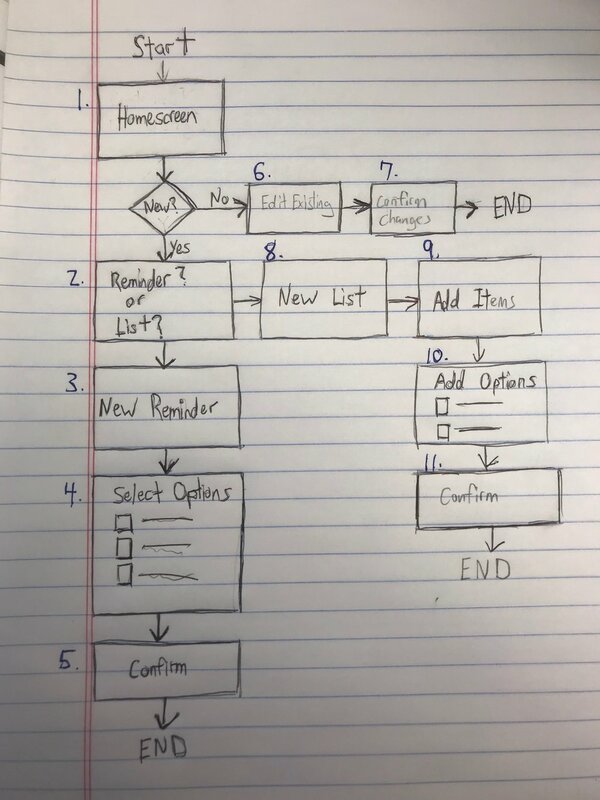 In order to gain user adoption, or just users grabbing s sticky note and writing it down, we need to make the ReminderX app as light weight and as streamlined as possible. Features just need to work. In order to build trust with users, the ReminderX app needs to seem bullet proof. Reminders need to work the first time and shared reminders need to come through to the other users or devices without fail. The home screen has a dashboard that highlights lists and upcoming events. The user can either add anew item or edit and existing item if one exists. The primary navigation is easily accessible and allows you to create a new list or reminder. This is meant to illustrate the adding of details and options such as sharing the reminder with friends etc. The Reminder has been adde to your dashboard. appear once the details have been added. Confirmation that the change have been saved. 1. Adding the first “to-do” list. 2. Adding the first "reminder event"
3. Sharing an event or list with a friend. Also shown is a calendar overview andprimary navigation that opens in a lightbox. 4. Shows your profile and the points redemption feature. This feature works by allotting points to actions within the app. For example completing your profile information earns you X number of points. Completing tasks on your to-do list earns you X number of points each etc. Once you accumulate X number of points, you can redeem them for a coupon code at partnering retailers. This point system not only will incentivize users to keep using the app, but could generate revenue through leads with our partnering retailers. After the user downloads the app, this is the first screen that that will see. There will be placeholder content in place of where their lists and events will be placed. The user could either touch the placeholder lists themselves to create a new list or reminder, or tap the + icon to add a new list or reminder. When a user touches the main menu the following menu items will appear: Profile, Share, Lists, Reminders. There will be an animation that slides the icons up and down. When the user touch’s the X, the main menu will animate down. Users can use most of the apps features without creating a profile. But to be able to share task and events with people and to earn points for completing tasks. They will need to create a profile. These are the first two steps in the enrollment process. The user must fill out basic information the photo is optional. In the third step, the user can add friends to share lists and reminders with. The last step allows user to indicate which stores they’re interested in being given discounts to. Once users have created a profile they can view their profile information and redeem points they have earned. By partnering with local and online businesses we would negotiate discounts for our users for driving traffic to their websites. Eventually we could sell advertising space and negotiate for better deals once our user base has increased. This is the homepage after the user has added items to a list and reminders. If there were multiple lists the user would be able to swipe left and right to view them. The events will have a details view on touch and the ability to be converted to a calendar view. From the main menu, the user can create anew list. The user can add item in the second stepand share the list with multiple friends. From the main menu, the user can create a new reminder. Once the title has been added, the user has the option to add additional notes about the reminder within the first step. The user can choose either to be reminded at a specific date and time, or when arriving or departing from a specific location. Setting the date and time or location is done simply by taping the blue text which will open a dialog box on the screen where the user can input the desired information. Note that the user can simply select “I’m done” if they do not wish to add any more additional information. From the main menu the user can select share. Sharing would take them directly to a screen that allows them to select multiple users to share items with. The user can select multiple reminders orlists to share with friends.